The name of this beautiful invitation sums up the design perfectly – ‘Timeless’. It’s more than this though, it’s elegant, luxurious and pretty, which is just how you want to feel on your wedding day. Perfect. If you want to feel like a princess on your big day, you’ll want to achieve a fairytale feel from the very start. Your save-the-date cards or invitations are your first opportunity to ‘set the stage’ and give your guests a glimpse into your big day and this delightful range of wedding stationery will certainly meet their expectations. Attractive in design, the Timeless Romance collection from Olivia Samuel is oh-so graceful and has a dream-like whimsical feel. 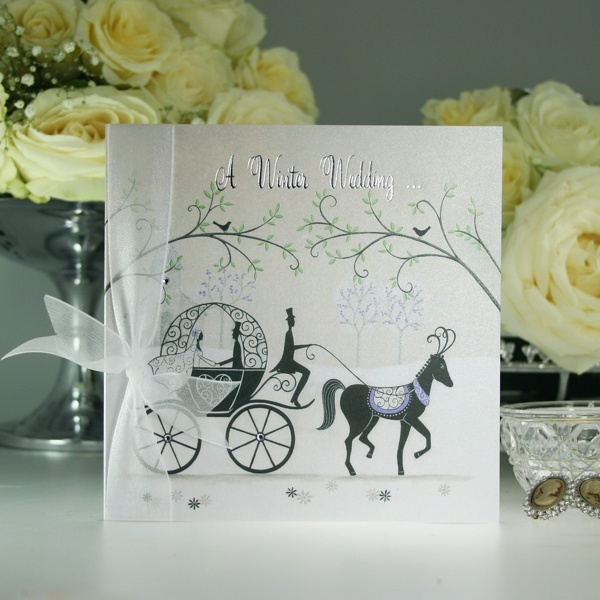 It exquisitely depicts a traditional romantic wedding day dream – a horse drawn carriage. A smart postilion is depicted wearing a top hat and tails, guiding an elegant horse who leads the ornate carriage and the loved-up couple to their destination. Romantic minds might see the image as depicting the journey of married life beginning on this special day, your wedding day. The added bonuses of being able to customise the typeface and upload your own wording mean that this design will be personal to you. 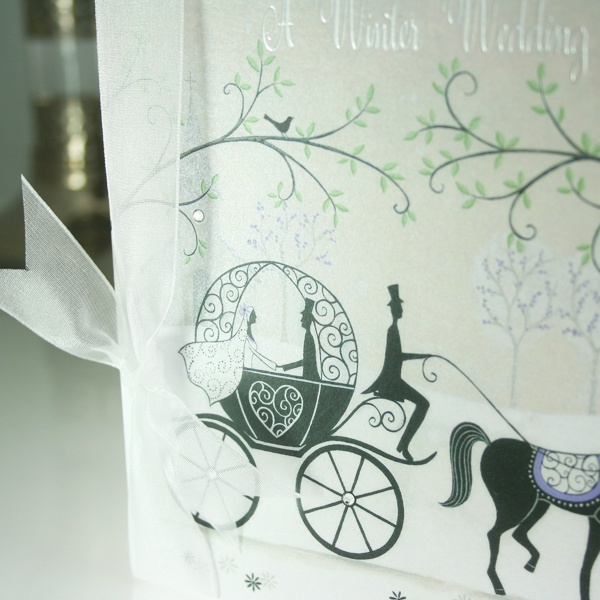 Featuring opulent hand foil silver lettering (you can choose to have ‘A Winter Wedding’ or ‘An Invitation’ printed on the front) on the finest Italian shimmer board (150x150mm) and finished with Swarovski crystals and sheer white ribbon, the Timeless Roman collection doesn’t scrimp on style or quality. Why not request a sample and experience the Timeless Romance’s beautiful design and luxurious quality in person? Tags: Crystals, Fairytale, Pearlescent, Princess.